My curiosity about spinning dog fur, also called Chiengora and considered an exotic fiber, began shortly after I traded a treadle sewing machine for an old spinning wheel. New to spinning, I tried twisting anything that vaguely resembled fiber and talked too much about what might be spun. A family friend heard me wonder about dog fur and sometime later I received a box of English Sheep Dog fur. Actually, it was a box filled with vacuum packed bags of dog fur. Eventually I worked up enough courage to open a bag and let it explode into the room – and my learning curve began. The first experiment was to card the fur with wool in order to give it some memory, knit some hats, and wove scarves for the dog’s owners. With plenty left over, more scarves, more hats, and there is still yarn left in the ‘someday for something’ pile. Pure English Sheep Dog fur spins nicely with or without blending with wool. It’s ok to throw away the matted clumps! It’s a waste of time to try to save every fiber. People are really impressed when they learn the yarn is dog, then promptly put it to their nose and ask if it smells like dog when it’s wet. My second experiment was with the fur from a friend’s mixed breed spaniel/poodle, named Winnie. She barely sheds and her coat is more hair than fur with no noticeable undercoat. This batch of dog fur was from her ‘haircuts’ by the groomer. It was too slippery, wouldn’t hold together, so I blended it with wool to give it some grab. Even after blending it with wool the yarn wanted to shed. I returned Winnie’s yarn to her owner and don’t know if it was ever used. Technique for washing fur is easy – Soak in a big bowl with hot water & Dawn dish detergent (or shampoo), Rinse and spin dry in a Salad Spinner, spread the gobs out onto a towel, then transfer to screening (inside away from any breeze!). And, Yes, it’s ok to use the kitchen sink because the salad spinner keeps the fur from getting to your drain. Next adventure is with my own dog’s fur. Big old Bernese Mountain Dog who hates to be brushed or combed. But, what little she lets me do has become 15 tall wastebasket size bags full of washed fur ready to card and spin. Don’t procrastinate! Dog owners and groomers can be wonderful sources of fiber. Many thanks Sandy for these wonderful lessons on spinning dog fur. In September 2009, I opened my new issue of Piecework Magazine to read a re-print of a 1994 article by Linda Ligon called “The Ubiquitous Loop.” That was my introduction to simple looping, which became a gateway into the broader world of single needle work. It’s made with one needle (or no needle at all if your fiber is stiff and pointy enough to be worked by itself), and the movements are akin to hand sewing. In fact, the movements are exactly the same as for the buttonhole stitch in sewing or embroidery, only done in the air instead of in a piece of solid fabric. Sandals and bags from the first millennium CE in the American Southwest. Today in Papua New Guinea, Bolivia, Ecuador, and among the Hopi people, loop upon loop builds practical bucket-shaped bags, large decorative carrying bags, and gourd covers for ceremonial use. Simple looping has been used for sturdy objects, like baskets, bags, and shoes. It has been used to create decorative edgings on larger textiles. It can be made simple and dense, or with skipped stitches and contours for an open, decorative fabric. Like crochet, it is endlessly organic and flexible. It’s very easy to create a fabric around an object, shaping as you go, to make a “sleeve” that was made to fit. After reading the short article by Linda Ligon and then completing the tiny pouch from the related project, I was hooked. (If you’re interested in that pattern by Robin Taylor Dougherty, which includes a basic how-to on simple looping, you can find it on the Interweave Press website at http://www.interweave.com/article/needlework/a-treasure-pouch-in-simple-looping/). I made a couple of other pouches at different gauges, following the same basic idea. Then I found Donna Kallner (you can find her too online at http://www.donnakallnerfiberart.com/looping/about-looping/), bought her book, and worked through many of the projects in it. I fell deep into the rabbit hole of single needle work, adding traditional northern European needle binding (aka naalbinding, just to offer one possible spelling) to my list of fiber habits. Other single needle techniques include netting, needle lace, and (if you want to follow me right off the edge), shuttle tatting. Katherine will be at Sheep and Shawl on Sunday March 5th.lecturing on Naailbinding and will be giving a one day work shop later in March. Check out the Sheep and Shawl website for more details. FIBERuary is a celebration of all things fiber. 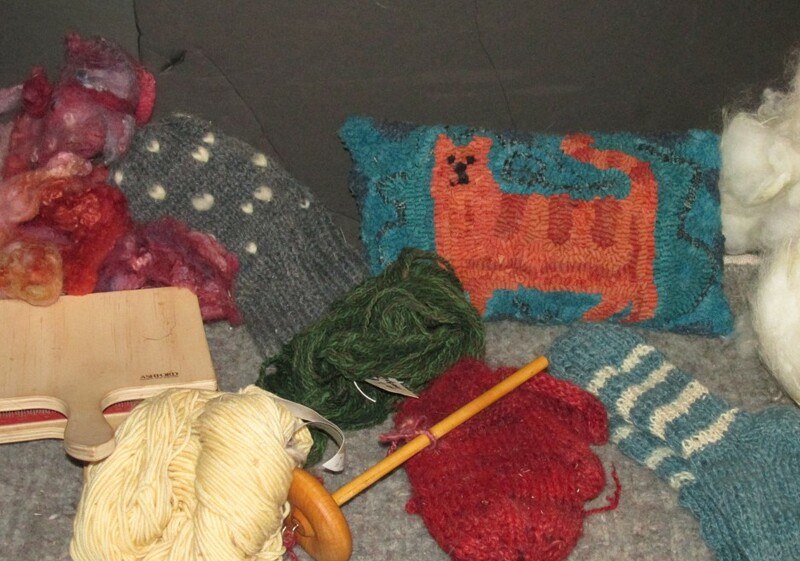 I myself participate in a wide variety of fiber-related activities as a production weaver and a knitting teacher. I’m also a lazy spinner, an occasional felter and have dabbled in dyeing. Across all these fiberful activities the thing I love most is the community of other fabulous fiber fiends that make working with fiber so much fun. I could write about any of these communities, the spinning group that I have am lucky to be a part of, or of the wonderful dye party I attended last summer or about the joy of watching my knitting students learning not just from me, but from one another. But instead I am going to write about my weaving community, and in particular, about a wonderful, magical week-long collaboration I did with another young weaver, Kira Frech. People often think of weaving as a solitary activity, and of course, it can be. But it needn’t be, and historically weaving would have been a community affair. I learned (in my time as an apprentice at the Vävstuga Weaving School) that in Sweden each village would have had a loom or looms in a sort of community center. Weavers would spend the winter cutting up rags which they would then weave on the community looms in spring (or whenever it was their turn). Weavers helped one another dress the loom and so many hands made light(er) work. Because of this Scandinavian tradition of cooperative weaving, students at Vävstuga learn to dress looms in teams. Kira and I became friends when I was an apprentice and she came to Vävstiga for Basics, the pre-requisite for most other weaving courses there. Later, she returned for the Väv Immersion program, a 15-week course inspired by the weaving course Becky Ashenden had taken nearly 35 years ago at the Sätergläntan School in Sweden. We stay in touch thanks to the internet and earlier this year decided to create our own weaving mini-retreat and collaboration at my studio in Shelburne Falls. In 5 days we wound, beamed, threaded, sleyed and wove a 10-shaft satin damask block design and an 8 shaft pinwheel draft. We each chose a project that was somewhat outside of our weaving norm and which allowed us to take advantage of each others expertise. I designed the pinwheel project in wool (for pillows!) with the knowledge that any troubles I had could be helped by Kira’s greater expertise in weaving wool. She designed the 10-shaft satin damask project in cotton and linen knowing that I spend a lot of time weaving similar block structures. We were thus able to support one another and felt encouraged to try new things. Because we are trained, literally, in the same school of weaving, Kira and I were able to almost seamlessly move through the steps of setting up the looms together. It was truly magical. We worked together to solve problems along the way and accomplished more as a team than we could have flying solo. Here are some photos of us setting up the damask piece together. Once the weaving began our looms were booming and shuttles were flying and the studio just felt more alive. A few days later we were cutting off and packing things up so Kira could escape before a snowstorm hit. When she was gone the studio felt empty and I found myself wishing I could have a weaving buddy with me every day! The bottom line is that weaving in community is so much better than weaving on your own. In fact, even Kira and I together could not have done this by ourselves! And that’s because we borrowed a pair of damask pulleys for this project from another local weaver, Elaine Palmer! It was only by all our powers combined that so much amazing weaving happened that week. I feel so grateful for my wonderful weaving community. It’s February, 2017, and there are seven young Finnsheep up in my barn. They are currently about 10 months old: five ewes and two rams. Most of them have been here since they were 10 weeks old. Seeing as they are my first ever sheep, it’s been a busy, educational, eight months for me – but to be fair, the education began a long, long time before the sheep arrived. Almost three years ago, when we moved to Western Mass from the mid-west, I knew I’d be looking to set up with animals. Though I wasn’t raised in the country, in Minnesota we’d had chickens and horses and land, so I had experience with pastures, tractors, manure piles, frozen water buckets, and the like – enough experience, hopefully, to know what I needed and what I was getting into. We found a property that would be suitable for a small flock and also meet the requirements of the other (human) members of my family. It was time to buckle down and learn what I needed to do. I tried to learn in whatever ways I could. There were books in the library, books on my bookshelves, magazines and websites. I attended online webinar series (yay! Maryland Sheep&Goat! ), fencing seminars, Sheep and Wool Festivals and the workshops they hosted, Jill and Jim H-L’s Sheep-in-a-Day class (yay! pragmatic and hands-on! ), Sheep Growers’ Association days. I talked to everyone I encountered who had or had had sheep. I got a spinning wheel and learned how to use it. I tried to learn something about EVERYTHING, or at least it feels that way. Sheep breeds. Sheep diseases. The structure of wool, the structure of yarn. Fencing types, pros, cons. Livestock guard animals. Fleece processors. Mills. Carcasses. Wholesale cuts, retail cuts. Parasites. Forbes. Electricity. Drum carders. Combing. Picking. Flicking. Sheep reproduction. Scours. Scouring. Netting. Deep bedding. Skirting. Hoof trimming. Hay. Rhododendron, Yew, Mountain Laurel. Antibiotics. SubQ, IM. Drenching. CDT. Selenium. Copper. Hi-tensile knots. Coating. Creep. H. contortus. On and on. And all the while, I knew that I couldn’t really learn husbandry from a book – that at some point, soon, I was going to have to jump in with both feet and make my mistakes and take my knocks. Getting my infrastructure in place took up the second summer in Massachusetts. My property had lovely hillside pasture, but no fencing or barn. I know that a lot of people run their sheep with portable electric netting alone, but I chose to build a permanent fence – wood posts, woven wire, electrified wires at the top and bottom – and it helps me sleep when the coyotes are singing their crazy songs. My son and I built the entire fence by ourselves, and that is a whole ‘nother story entirely – I can just say that it was a rich learning experience. Structure-wise, all the sheep would need was a simple shed. But, for me, I built a barn (had it built, truly), one with four walls and doors that close. So now there is a place for the sheep, and room as well to store equipment and hay. And all of us, the ewes and me, will be comfortably out of the wind and wet when lambing time comes. Currently, the barn seems really big, but with luck my estimates were sound, and when my flock reaches its full number, the square footage will be just right – Goldilocks style. So a year and a half in, I had a barn and a fence and a head full of info, but when it came time to choose a specific breed of sheep, I was adrift. I’d collected an embarrassing number of fleeces and partial fleeces, trying to decide what I liked for handspinning, but nothing was clicking. Or if I liked the fiber, I was finding that the breed was too wild, or too big, or not suited to a Massachusetts climate, or something else that made them not right for my farm. I’d ruled out Finns early on because I didn’t like the sound of “litters of lambs”. One of Finnsheep’s most notable characteristics is their propensity to birth multiple lambs: not just twins, but triplets, quads, and beyond. Despite my reservations, I ended up talking to a Finn breeder at her booth at Rhinebeck in the fall of ’15. She assured me that Finnsheep’s awesome mothering instincts more than made up for the multiples – Finn mothers love their lambs and will not only NOT reject them (which sometimes happens with other breeds), they are even known to steal other ewes’ offspring. This breeder assured me that she didn’t put up with bottle feeding lots of orphans, or “bummer” lambs, and that the sheep did the work. The conversation peaked my curiosity, and soon I was collecting more fleece samples, this time from different Finn farms. And I loved what I found. Finn fleeces vary, from animal to animal and farm to farm, but they are generally soft and silky, retaining both a good degree of bounce and often remarkable luster. They come in colors – there is a broad palate of blacks, browns, grays and fawns, and patterns – solid, badger (light top, dark under), HST (head, socks, tail) & Piebald. For me, they were fun to spin and easy to prep – not a lot of grease and easy to wash, with fairly uniform staple length and consistency within each fleece. Some samples felted very easily, others not so much, so there is variability in that, too. And beyond the fleece characteristics, I really liked what I found about Finns as a breed: they are medium sized animals, naturally short-tailed so no need for docking, hardy in our climate, used as dual-purpose animals (fiber and meat), and known for their very sweet dispositions. And all those darling babies. It looked like a good match for a new shepherd who would be working solo and wasn’t getting any younger. I picked my favorite sample and placed an order with that breeder, and waited for my lambs. From the time I picked them up in mid-June, it’s been smooth enough sailing, I think. I can’t say I was prepared for absolutely everything or knew what to do at every turn, but the sheep have been sweet and easy, and so far everybody seems well. We’ve gotten through vaccinations (oh no, needles! ), de-worming (not so bad), learning about electric netting (only takes once), separating the boys from the girls (don’t wait too long! ), putting them back together (no fireworks to speak of- seems sheep are discreet), and learning to love hay and put up with the dull days of winter. By late summer, I got a llama to serve as sentinel for the flock. Chris took to his new job with surprising conviction, and the lambs took to Chris with surprising affection. As our strange February weather begins to hint at spring and the maple trees get going, the flock’s fleeces are big and thick and I’m looking forward to shearing day, even though it’s clear that I’ll need to get better at keeping the hay out of their wool (dribbly llama, indeed). I’m wondering if the girls will be showing their bellies when the wool comes off. They are young, but Finns are said to be capable mothers even as yearlings, so we’ll see. They certainly tell me they’re hungry enough to be growing lambs, every time I show up in the barn to feed them! So I was prepared, to the extent I could be, and I am pleased, beyond expectation. All along as well, I’ve been making mistakes: doing things wrong and doing ‘em over. Small stuff, mostly, I think – I’m likely not yet aware of half the mistakes I’ve made so far. Hopefully none of them is critical. And while I hope my sheep are pregnant, I’ll certainly be terrified if, and when, the lambs arrive in a couple of months. In other words, not every day is easy, and not everything is fun. I’ll be glad when I have several seasons of shepherding under my belt, and when every situation is not brand new, another test to pass. But I’m grateful to be learning so much, and to have great people and resources at hand to teach me. I’m grateful as well that this education so far has only scratched the surface: it’s headsmacking to appreciate how much there is that can be known, and learned, and done. If I keep the right attitude I will stay satisfyingly busy until I’m dead. It’s good to have goals. One thing I wasn’t expecting was how taken I’d be by these animals’ temperaments. I thought sheep would be fairly neutral: interested in grass, grain, and each other, tolerant (I hoped) of their keeper. These sheep are curious, friendly, and sweet as well: I get tail wags and zipper nibbles, they get their faces petted. I always have help with whatever I’m shoveling, or moving, or mending. I don’t know if this is sheep in general, Finnsheep in particular, or just my sheep especially. And for this, I’m not really concerned to find an answer. I’m happy to be these sheep’s shepherd, and I’ll look forward to their mentoring. Here’s thanks to the sheep in the year that’s passed, and thanks to sheep in the years to come!